For Kathryn (Helen McCrory) – Max’s estranged wife – this is a second chance to be a mother to her son. A respected former journalist from a wealthy British family, she’s determined to reconnect with the sensitive boy Max ripped away from her. As Max and Kathryn fight for the soul of their son, another fight is about to begin. Caden knows secrets that could bring Max’s empire crashing down. And Caden’s silence can’t be bought. This is a fight for family, a fight for truth – a fight for the heart of the nation. 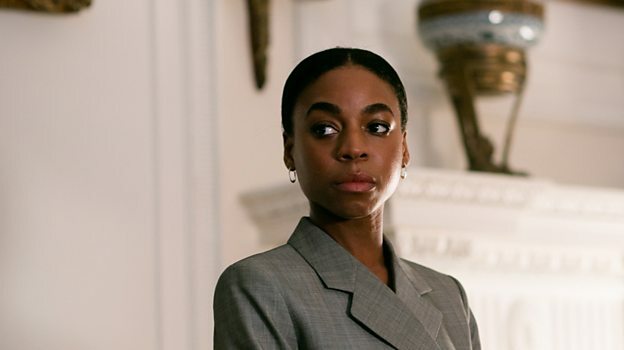 Pippa Bennett-Warner plays Lauren in MotherFatherSon. Where do we meet Lauren at the start of the series, and – without giving too much away – can you hint at what’s in store for her in future episodes? Lauren is very much at Max’s side at the start of the series. She’s his right-hand woman, his confidante, and she’s very much thriving at The National Reporter. Over the course of the series, and in the aftermath of Caden’s stroke in episode one, Lauren begins to see Max in a different light. A wedge is driven between them and she’s forced to make a huge moral decision. Describe Lauren to us in five words. Ambitious, composed, guarded, loyal and professional. What made you want to be a part of MotherFatherSon? I thought the scripts were fantastic. I read one to six in one sitting and desperately wanted to know how it ended. I remember feeling really excited that Lauren existed in this world. There she was, this young black woman, who is educated, successful, and standing by the side of one of the most powerful men in the country. I felt empowered and intrigued. What were the scenes you enjoyed filming the most, and why? That’s a tough question, but two immediately come to mind. The first time I spoke on set was for the cake scene in episode two, with Paul Ready’s character, Nick. I was so nervous but really enjoyed it. The director James Kent allowed me to have a real play with the material, which was a lot of fun. The second one comes later on in the series with Richard in the fab Leadenhall Building, perhaps better known as the ‘cheese grater’ in central London, where Max’s office is and his media operations are based. I won’t go into what happens in the scene, but it’s an emotional one. Were there any memorable moments (whether funny or otherwise) from set? There are too many to single out, but yes is the answer. I had such a hoot filming with Sarah Lancashire, Karen Bryson and Richard Gere. Do you think you’d get on with Lauren in real life? Yes, but I’d probably be a bit intimidated by her. Did you do any research to play Lauren? I had a look at the relationships between Henry VIII and Thomas Cromwell, Lear and the Fool, and I also swotted up on Rebekah Brooks. They’re polar opposites, but that same steely ambition is there. Rebekah has been described as being “charming and always able to get what she wanted out of people” and, though Lauren’s very much a fictional character and isn’t based on Rebekah, she has that ability. I had to develop a real stamina to play Lauren. Tom’s writing demanded it. MotherFatherSon was challenging, but in all the right ways.